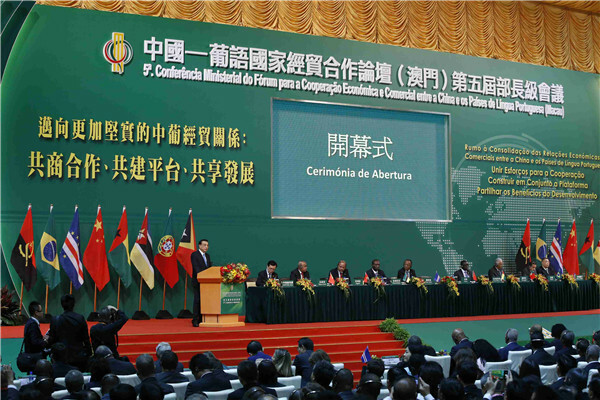 The Forum for Economic and Trade Cooperation between China and Portuguese-speaking Countries is taking place in Macao. 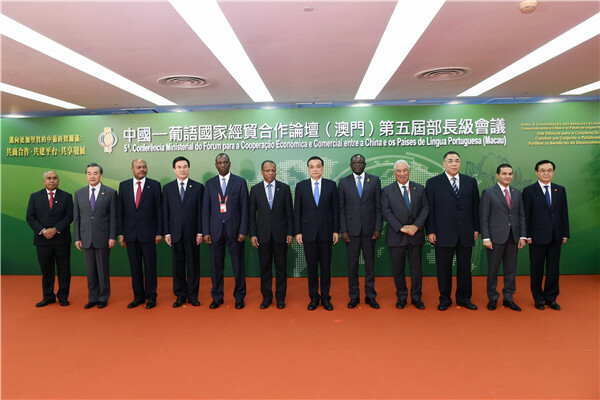 Premier Li Keqiang and his counterparts from Portugal, Cape Verde, Guinea-Bissau and Mozambique are in attendance. Every three years, leaders from China and seven Portuguese-speaking countries meet in Macao to explore new areas for economic and commercial cooperation. Last year, China’s trade volume with these countries reached U.S.$100 billion. 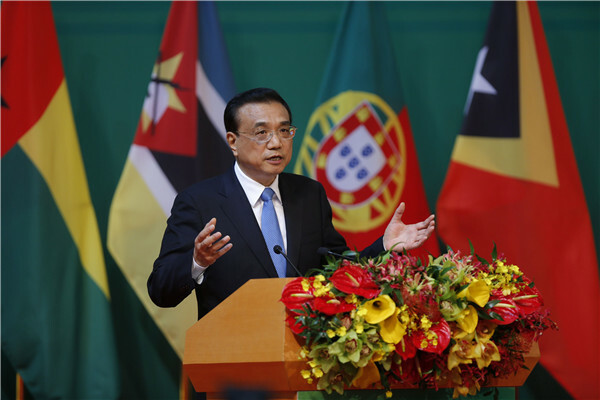 China has become the fastest-growing export partner to Portuguese-speaking countries. “Fruitful achievements have been made between us in many areas such as agriculture, environmental protection, transportation, telecommunications and finance,” Li said. China and the Portuguese-speaking countries contain 22 percent of the world’s population and account for 17 percent of global economic output. Li says China and these nations can complement one another in areas such as finance, technology and resources. 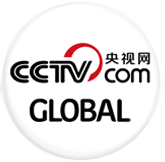 “China is willing to work with the Portugese speaking countries to expand markets, to improve customs, inspection and quarantine, certification and accreditation cooperation, to strengthen the protection of intellectual property rights, and to create a good environment for trade and investment,” Li said. He also called for cooperation in production capacity, a strengthening of cultural exchanges and emphasized Macao's role as a linking bridge. “The central government fully supports Macao as a platform to service trade cooperation between China and the Portuguese-speaking countries, to build an economic and trade cooperation convention and exhibition center, a service platform for small and medium-sized enterprises and a commodities distribution center,” Li said. 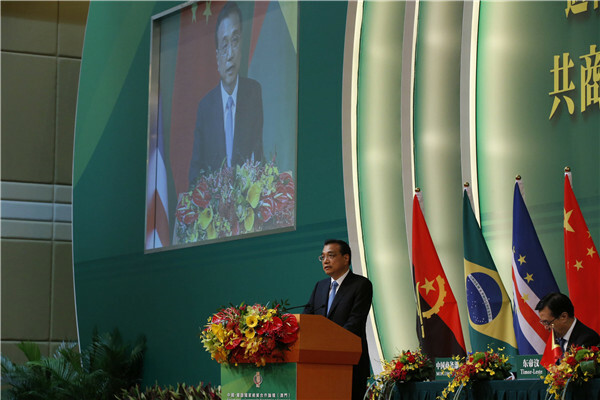 Li also announced a raft of new measures to enhance ties, including aid and preferential loans worth 4 billion yuan (almost U.S.$600 million) to Portuguese-speaking countries in Asia and Africa over the next three years. Calling the Portuguese-speaking countries “reliable partners,” Li said friendly cooperation is key to promote growth despite the sluggish recovery of the world economy and added that China’s door is always open to world economies. Premier Li posed for group photos with delegation heads before the opening ceremony.